As you might be aware, the little video I posted a couple weeks ago of my daughter singing “The Imperial March” went viral. It’s up past 3 million views on YouTube, and has gotten attention from the Today Show, the official Star Wars Twitter account, and maybe even your local news channel. It has been a bizarre experience–so I figured I’d share a little about what it’s like, being the parents of a famous toddler. First and foremost, I think what I’ve learned is that internet fame can be unpredictable and undeserved. I’ve got three kids and they frequently do things that entertain me or amaze me. Sometimes I get them on camera, but quite often I don’t. The fact that this short little video is more popular than any other video or photo I’ve shared of my daughters is somewhat surreal. (I mean, it’s not even a good video, objectively speaking–you can hardly see anything.) That’s not to say nobody earns their fame on the internet: there are clearly some people who work very hard to craft videos, attract viewers and subscribers, maximize page views. But that’s not what happened in my case. I’m sure a huge part of the popularity of the video isn’t just the fact that my toddler was singing in her crib, but that she was singing “The Imperial March.” And not only that, but that the internet is currently on high alert for anything Star Wars-related as we anticipate December 18. Would the video have the same success if I had captured it a year ago, or a year from now? Maybe not. What’s more, it’s not even entirely unique. 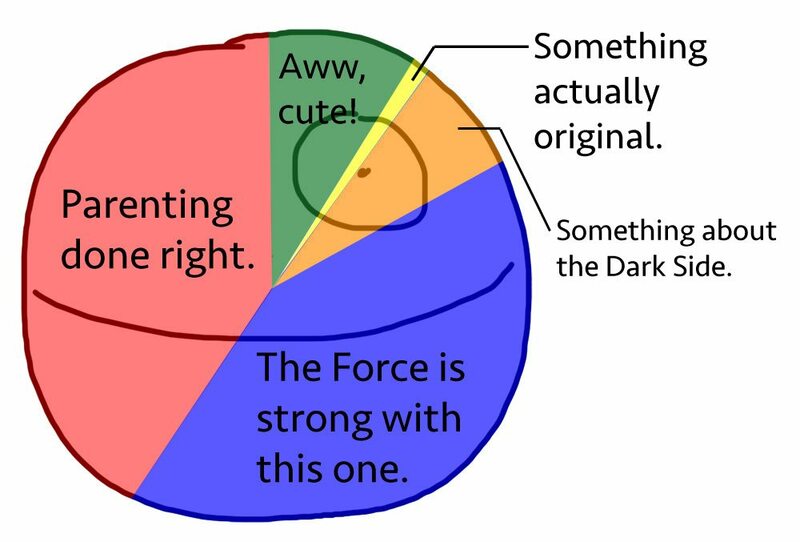 As I’ve learned from comments from both friends and total strangers, apparently the phenomenon of toddlers humming “The Imperial March” is pretty common. It probably says more about the power of John Williams’ composition than my own daughter’s musical abilities. And the fame is (I think) fleeting. Looking at the analytics for the video, it looks like it has peaked. After about four days of nearly half a million views each, the graph drops off sharply. I’m sure it will continue getting some views here and there, but it seems like it’s made the rounds. I’ve seen a comparable drop in the number of emails I’m getting and comments on YouTube. Although it does look like there was an uptick in views in Spain yesterday. For me, 3 million views is pretty mind-boggling–but compared to some other viral videos, it’s not even close. I remarked to my wife that it’s funny that we’ve gotten so many views on this little tiny video, and she pointed out that, well, it’s a great length for sharing. When somebody shares a video with you and it’s 5 minutes long, you have to think about whether you’re gonna watch the whole thing–and whether you feel like sharing it with everyone else. 17 seconds? Heck, watch it twice, and then share it with everyone. It’s only 17 seconds. Y’all have spent over a YEAR AND A HALF watching this clip. Seriously. Which makes it all the more mind-boggling to me that it has been viewed for 914,146 minutes so far–that’s over a year and a half. But, clearly, it’s short enough that nobody stops halfway through. According to the analytics, on average people watch the whole thing. It’s over before you get tired of it. Fame. YouTube views. A toddler craves not these things. My toddler doesn’t care that she’s famous. She’s too young to understand what’s going on. She doesn’t care that there are people across the world watching her sing in her crib. She does know that it’s a video of her singing, and she’ll watch it with as much enthusiasm as anyone else, but she doesn’t have any grasp of what’s going on outside of her own experiences. Which also means I still haven’t gotten a video of her singing directly to the camera. 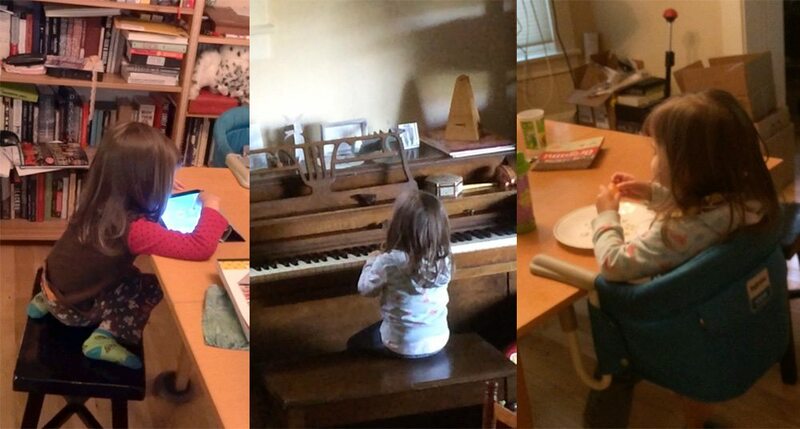 I’ll catch her singing to herself–sitting at the piano, while having a snack, while playing on the iPad–but as soon as I pull out the camera, she’s done. The number of video files I’ve started and deleted, trying to capture her singing, is pretty ridiculous. My older daughters, however, particularly my middle-schooler, are intensely aware of their little sister’s internet fame. My oldest has already experienced the “Wait, that’s your sister?” phenomenon, when somebody is talking about the video and then finds out that it’s not a total stranger. Never tell me the odd comments on YouTube. Okay, so I know you’re never supposed to read the comments. I’ve skipped most of the comments on other sites simply because, well, there are so many of them. But it turns out that most of the comments on YouTube have been positive. There are also a very limited number of types of comments, at least on YouTube, as evidenced by this chart. I also did get some questions about the baby monitor itself (which led to various discussions among viewers about video monitors), so in case you’re curious, it’s the VTech VM333, which I reviewed last year. And, of course, we’ve gotten some comments about our parenting skills (aside from “parenting done right”), because how better to judge somebody’s parenting skills than a 17-second clip on the internet, right? I’ve also gotten some advice about putting her in a toddler bed, including one comment that she’s well past the length of the crib. (She isn’t. She’s about 2/3 the length of the crib, and I’m keeping her in it as long as she’ll stay.) Even a used Stokke crib from Craigslist isn’t cheap–I’m getting as much use out of this thing as I can. Plus, she likes her crib. Why wouldn’t I use it? Apparently my wife has seen comments about the “absent mother,” which is not only frustrating, but inaccurate, as she was in the dining room at the time I was filming the video anyway. Yes, I’m a stay-at-home dad and she works, but she also sat and watched Star Wars with the rest of us. And it’s also 2015. Get over it. I actually haven’t seen too many comments about the video being faked, though I did see one suggesting this was really just a viral ad for Star Wars and another asking if I had a video that showed her lips moving. To the first: I wish, because then Lucasfilm would have paid me, right? And to the second: if I had one of those, I would’ve posted it. Honestly, though, I have to admit that it’s not a great clip and that I can’t produce any evidence that it’s real. I’m not surprised that there could be some skepticism about it, and actually expected more. You pretty much just have to take my word for it if you don’t know my kid–or if you haven’t been around toddlers, I guess. At this age, they just absorb and repeat stuff like crazy, and then they forget it and learn something else. In that respect, she’s a lot like other toddlers–“The Imperial March” and the Star Wars themes are just two of her current faves, and who knows how long it will be before she switches to something else? But if it makes you happy to think that I’m the sort of person who would go to the lengths of faking a video of my toddler in the hopes of internet fame, I won’t disabuse you of that notion. media), I will say that I was promised an advance against a revenue split, though I haven’t actually seen a cent from any of this, and have no idea how much it actually costs a TV station to use the clip. What is nice, though, is being able to just refer any inquiries to a particular email address and not having to field those all myself. I could have just kept the video licensing rights myself and tried to make some money from AdSense on the YouTube video, but as I’m not in the habit of posting a lot of videos, I felt like maybe the advance would be a better deal than what I’d be making through ads on my own anyway. Finally, going viral can be very time-consuming, just in handling the volume of emails I’ve gotten. So, if you’ll excuse me, I still have board games and books to review, kids to shuttle to and from school, and laundry to do. Originally published on 2015-11-23 by Jonathan H. Liu at Geek Dad .